Pete’s Suitcase Circus workshops provide a fantastic learning experience for primary and secondary age, special needs, young adults in college, arts and community events, and playful older adults at corporate team building events. 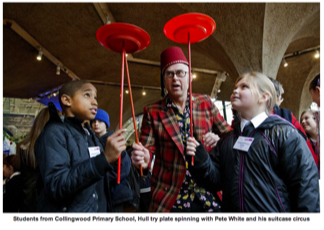 Pete provides dynamic learning experiences which are challenging, exciting and good fun. Safe activities, professionally delivered. "Just wanted to say thank you so much for today. The children really enjoyed it and learnt some valuable skills. We can't wait to get cracking on with them in class! You had a wonderful presence and manner with the children and they really responded well to you." "Thank you for the fantastic circus sessions, the children and staff thoroughly enjoyed them. It made such an impression on the whole school that Mr Elam has already ordered a number of resources so that he can run an out of hours circus skills club. Blackgates would have no hesitation in working with you again." A great have-a-go activity for all ages and abilities, research suggests that learning circus skills aids pupil concentration, builds confidence, improves focus and balance, and promotes an understanding of the learning process. Pete's workshops promote positive behaviour and help each participant respond to challenges and find something they perform well at. Learning new skills such as hula hooping, juggling and plate spinning promotes a great sense of achievement. Workshops encourage not just individual learning, but also working with a partner and a group. If time permits, participants can present, perform and share their skills with their peers in a supportive environment such as an end of day assembly. Circus can will link to curriculum subjects such as science (gravity), mathematics (patterns and logical thinking), music (exploring and expressing ideas and feelings about music using movement), circus art, history, geography, and PSHE (developing confidence and responsibility and making the most of their abilities), as well as PE (balance, coordination). Thank you for your wonderful work at the 2012 Ilkley Literature Festival. Everyone really enjoyed it, we've had lots of enthusiastic feedback. The circus workshops were such a great success we'd love to do something similar again this year. “I have been aware of Pete's Suitcase Circus for a number of years, seeing him advertised at Folk Festivals and the like. However, it was when I saw him performing at Clock House, a respite care centre for children with special needs in Keighley, West Yorkshire, that I realised what an ideal visitor he would be at our special school. He came 12 months ago as our old building was about to close, and he came to our brand new building last Wednesday. Both visits were an unqualified success. On both occasions he did a 60 minute show for 80 or so pupils aged 11 up to 19, and over 50 staff (of various ages). All our pupils have special needs, but Pete's joyful mixture of verbal and visual humour, coupled with his undoubted skill with plates, juggling clubs, diabolo and the like, won over everyone. A circus day can be flexible to fit with your timetable. It can be one class for the whole day, or 4 or 5 classes throughout the day. Nursery and reception can be 30 - 45 minutes, with longer sessions as the participants get older. A typical circus day could start in assembly, where pete would be introduced to the school and provide a short performance to demonstrate the activities and skills the children will learn. This will be followed by structured circus skills workshops during the day, one class at a time. The session times are arranged with you to work alongside your timetable. Pete works with up to 30 participants, but can accommodate a few more if necessary. For larger numbers Pete can employ other professional workshop leaders as necessary. The equipment used and skills taught are selected to set the pupils a challenge whilst still giving them achievable goals. Depending on age and the time available the activities will include plate spinning, scarf, ball and club juggling, feather balancing, hula hooping, diabolo and presentation / performance skills. Learning that is challenging, exciting and fun. More details below. “Pete is a brilliant entertainer who engages with children of all ages. He put on a fantastic circus skills workshop for a children's group aged 4 - 14, it was absolutely superb. All the children had a brilliant time and haven't stopped talking about it since. They learned to juggle, hoop, spin plates and much more. Thank you so much for making the day a special one. Working with an international group of adults. 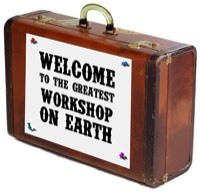 Click the above picture link to visit the Suitcase Circus Grundtvig Learner Workshop organised by Everything Is Possible. To see the project video on YouTube press this link. As used by athletes in the olympics. Part of the gymnasts floor routine, and fantastic for children to learn basic moves and then get creative devising a routine. Good for working in pairs and groups. Promotes concentration and cooperation. Hooping is great fun, good exercise and helps develop coordination and movement skills. Large hoops for waist and body, smaller, lighter hoops for arms, hands and neck. Scarves are brilliant for learning to throw, catch and juggle, they float down slowly and give you time to think about what is happening. Great for encouraging pupils to make up their own tricks and for partner / group work. Beanbags are used rather than balls as they are easier for children to catch and learn 1 - 3 ball juggling, culminating in the classic 3 ball juggling pattern. Balancing a plate on a stick is visually stimulating and great fun for nursery age up. Once the basic technique is learnt children can create their own tricks. Great for individual and group work. A great way to introduce pupils to the principles of balance and develop their fine motor skills. The beautiful feathers move slowly enabling the pupils to adjust and move with them, using the eye of the feather as a visual cue as they learn to balance on their finger, foot or nose. Diabolos are brilliant for Year 3 and above. Once you can get the diabolo spinning it can be thrown, caught and manipulated in as many ways as you can imagine, pupils can really get the 'bug' and be inspired to learn some fantastic tricks. Peter White is a fully qualified Youth and Community worker, has an up to date CRB certificate, public liability insurance and a risk assessment is available upon request. Pete works with schools in the Yorkshire region, but will travel further if you ask him nicely. Pete White is an exceptional talent, who can work equally brilliantly with adults, children, or teenagers. He joined us again at Festival at the Edge in Shropshire, to help us celebrate our 21st year as an international storytelling festival. He has worked with us many times over the years, and this is testament to his sterling work, whether that be comedy, juggling, or magic. He really is a unique talent, and I wouldn't hesitate in recommending him to anyone. Top class!